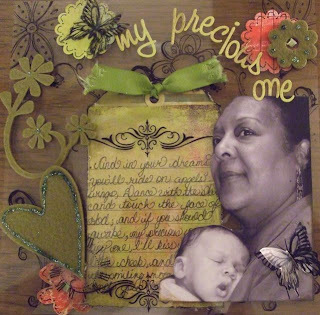 There is lots you can do with this theme - past or previous home, dream home, how you make it home, why it is home, etc. For me, my home is a manifestation of my soul. It is truly my nest and my safe haven, I've had to spend a lot of healing hours in my home and now - whenever I find myself away - Ifind myslef longing to return. For me showing my naked real self , without makeup is very scary, both for me to do and for you to look at. My daughter took this picture of me at our conference this weekend because she was laughing so hard at my bed head. You gotta admit, it's pretty scary!!!!! 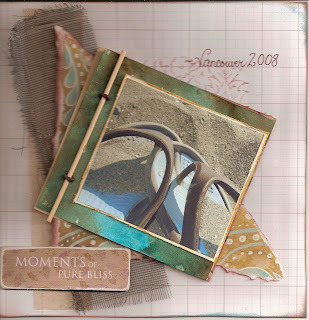 The challenge this week was to go through your junk drawer, your desk drawer, where ever you keep stuff junk and make a page using "non-scrap supplies". 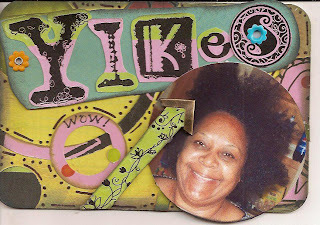 You can use magazines, tags from clothes or objects, wrapping paper, office supplies, receipts, just anything that you wouldn't use to embellish a traditional page. 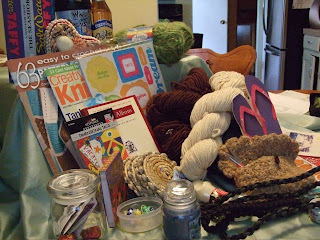 AND we want to easily see at least 3 different non-scrap supplies on your page. I just got home at midnight last night from a conference in Vancouver and I really wanted to use the pic I took of my flip flops covered in sand from English Bay so thanks for this challenge! I literally grabbed 3 items out of our junk drawer and got to work! Underneath the window screening is 2 way tape covered in sand to keep the beachy feel of this layout.The skewer and the elastic are holding my pictures together.The stamp on the paper was made with a very old wooden Indian print stamp ...a treasure I bought at this awesome store on this trip. Here is my take on the Week#1 challenge. I was inspired by the square photos, the awesome colors and the summer feel I got from the example. 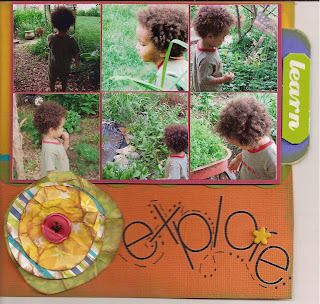 I am finally finishing up my ongoing alphabet book for my grandson.There is hidden journaling under the photo with the pull out 'learn' tab that reads:As my grandson is about to turn two, I love watching him discover his ever expanding world. On this day he was feeling quite independent as he explored the magic of Nana and Poppa's(us) backyard! 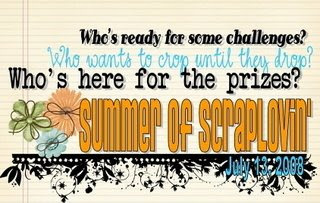 Follow me on my Summer of Scraplove Challenge! 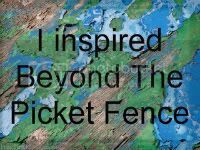 Go check out the amazing work that is being created over at Scraplove! Great way to exercise for free! I've always been a bit of a relaxed recycler but my daughter has put me over the edge. I am now composting and recylcing as a part of our daily regime. One thing she makes for me is natural house cleaners (in exchange for homemade bread) and I cannot say how much I LOVE them. They work better than anything else I've ever used and, as someone who suffers from allergies and recurring bronchitis, they are a godsend. Thanks Deanne!!! I got my package today!! Thank you , thank you Jennifer! (PCBChick)! It was chock full of yumminess. • a handmade crochet case full of essentials(scissors, measuring tape etc. • row markers, buttons and yummy chocolates which I had to hide from my grandson! •Smith's mintrose lip balm which smells good enough to eat!! •a portable coffee cup (the kind you can put pictures in) and inside were packets of hot chocolate!! • and the most thoughtful thing of all, Jennifer's husband made my little dog Percy the nicest leash I've ever seen! How did he know that he needed a new one! Percy is presently chewing on the bone they sent as well! What can I say but thank you so much! It really made my day when the postman arrived!!! Week #42 already!! Only 10 more to go! The rub on on my card says," Stop and dance in the flowers" and I was truly grateful that I was able to do just that this week!We celebrated our 36th wedding anniversary and spent time with our family who are not only dear to us but very near as well! 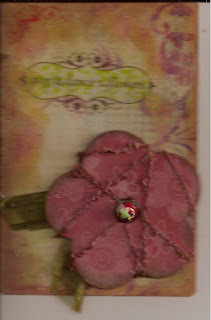 For this card I colored a chipboard flower with chalk ink and then stamped white flowers on it after I distressed the edges. 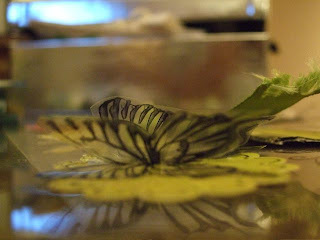 I then wrapped it in fiber and added satin ribbon for leaves. 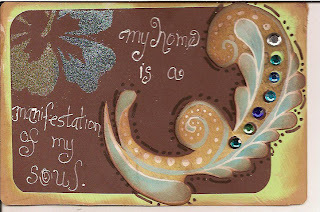 I stamped flourishes on the card, inked the edges and added the rub on. 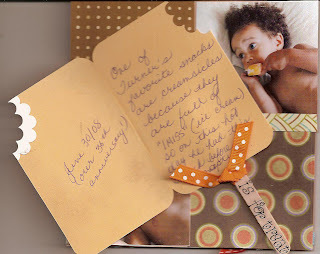 I am finally finishing up on the alphabet scrapbook for my grandson! Creamsicles are his new all time favorite treat so in this photo I had given him one just before his nap!